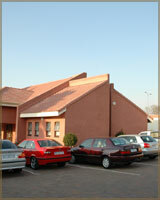 Eagles Nest is conveniently situated in the heart of Fourways in the northern suburbs of Johannesburg. The tranquil atmosphere makes Eagles Nest the ideal location for conferences, events & accommodation. We strive towards service excellence, friendly staff, home away from home experience and best value for money. Its proximity to the N1 freeway makes it the ideal venue for the busy executive who needs to break away for the day into a tranquil and peaceful environment but do not wish to drive hours to reach his destination. There is easy access from the N1 Freeway and William Nicol Drive. It offers secure parking 24 hours a day. There is on-site up-market accommodation for 18 couples or 21 singles making it convenient for trainers or executives who wish to stay over. An industrial kitchen allows for various catering options to ensure a pleasant food experience to all delegates. * Extra high internal walls allowing for banners. * Special entrance to the side of the building allowing for the easy off-loading of props or a stage. Our commitment is to friendly and efficient service and will always go the extra mile.